Me, my dad and my brother. When my brother and I were kids in the early nineties, one of my favorite family rituals was watching the new Star Trek episode each week. It would air at 6 PM and again at 10 the same night. The earlier broadcast was usually before my parents got home from work, so often we would follow this arrangement: my brother and I would retire at an earlier hour without fuss, and our reward was to be awakened to watch the later airing long after we were usually allowed to stay up. It was incredibly magical. Today is the twentieth anniversary of the passing of my father, Taimoor Ali Elfiki. I don’t know quite how to frame this reflection. I don’t want to do a ‘Greatest Hits’ of cherished memories, and despite my usual comfort in sharing vulnerable parts of my past, some of what I’ve been mulling over recently is in fact a bit tender for airing in this way just yet. Strange that I should feel like I have to disclaim that I’m holding some things back, but one aspect of grieving in this society seems to be a dance between maintaining enough privacy to feel safe, but not succumbing to an odd sort of shame. I’ll also say that although this doesn’t hang too heavy or ache all the time, I’ve known for some years that it’s a process I may never complete. This is just another step. When my dad passed in 1994, I was eleven years old and in the 5th grade. The memories from that time are well-worn by now, protected from further disintegration under heavy glass. The tears had mostly stopped within a week or so, but I remember over the next few weeks leaving school and going home sick–not pretending but actually sick, fever and all–several times, the trauma evidently taking its real material toll on my body. But there’s a short and a long term to grief, and I guess you could say I got used to not having a father over the course of some months. The next year adolescence was upon me, characterized primarily by my first really close friendships and–I’m serious you guys–some really strong crushes. These pangs were also reflected in the scripts I saw in movies and elsewhere about Best Friends and First Love. Consciously or not, I had begun to distance myself from my 11-year-old self, to disidentify with the ‘child’ I had been but felt I was no longer. In some poems and songs I wrote in middle and high school I characterized May 3, 1995 as the pivotal date of demarcation, a sort of B.C./A.D. of my life–a date that was decidedly not the anniversary of a parent’s death, but in fact the date a certain Really Strong Crush declined my invitation to the dance. Things started to swing back in college, as I started to seriously consider questions of heritage for the first time. The challenging reality then and still today is that I have no living relatives on that side of the family, no direct links to understanding what it means to be of Arab or Turkish descent. It also dawned in my last year at Oberlin that, at age 22, I would shortly traverse the point at which I’d lived more of my life without my dad than with him. 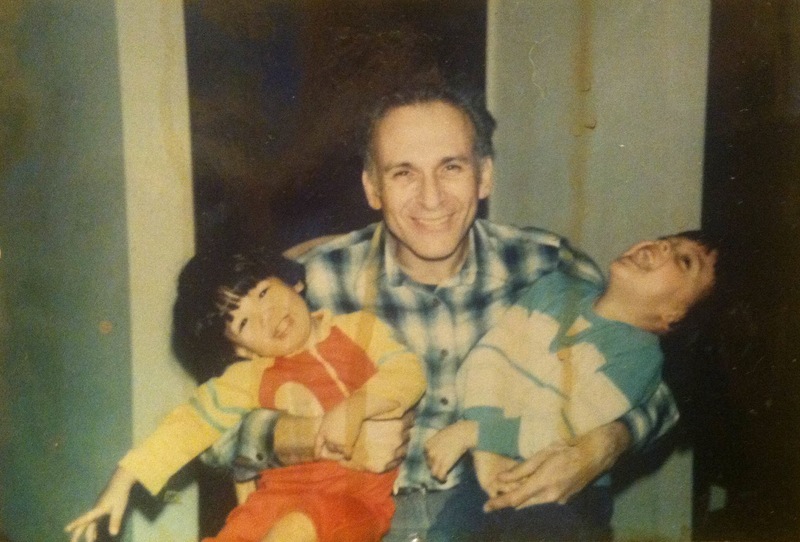 The times when I would miss–or, more accurately I think, long for, because as many have noted, it doesn’t make sense to say you miss something you’ve never had–my father’s presence began to creep back in more and more. Which was a headfuck, because it also seemed clear by that point that I was a different person than I would have been if he had lived, so did longing for him also in a way mean negating myself? One thing I haven’t really touched on is how profoundly and irrevocably the relationships with the other members of my family were changed by Daddy’s death. Out of respect for their privacy I won’t go too in depth, but I would like to express how grateful I am that we are not estranged from each other, that love and support is plainly evident in our relationships, because there’s so much more to understand with each other than by ourselves. Talking with my brother this weekend, for instance, helped me become aware of how I had been partitioning off ‘child Shareef’ from ‘adolescent Shareef’ in a fairly artificial and arbitrary way. My father, Taimoor Ali Elfiki, died on March 11, 1994. Here I am two decades later, 31 years old, on the eve of fatherhood myself. It occurs to me that the things that I value most about myself–being a caring partner and friend, a dedicated artist and activist–not only will they never be known by my father, but likely they were only remotely imagined if at all. I don’t presume he’d disapprove, but I also don’t assume he’d simply “be so proud of me”. I think it’d be much more dynamic, just like it is with my family that’s still around: there’d be exchange, confusion, questioning, encouragement, tension, reconciliation, all of the living, breathing influence and cross-influence that one thrives off of from the people one keeps close to them. No, I suppose I don’t need that, any more than I needed a father to guide me through how to be in a relationship or write a song. But I do long for it, I did, I always will. I suppose that’s just a feature of my human experience, and I think I’m okay with it. There are worse things to long for.